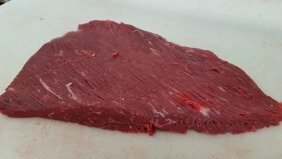 The beef brisket is a cheap cut, and tends to be very tough, but has great flavor. The best way how to cook beef brisket is in a liquid, low and slow cooked beef brisket becomes tender and juicy with superb flavor and will be the centrepiece of many great meals. Any good beef brisket recipe would not be complete without a good brisket dry rub, and this brisket rub recipe will not disappoint. We have added potatoes and carrots, but you can add or subtract any vegetable, such as parsnips, rutabaga etc. or you can cook beef brisket without the vegetables. Combine and mix all the ingredients for the dry rub in a bowl. If you want to impart more flavor of the rub into the brisket, prick brisket all over using a fork before lightly rubbing the dry rub onto the meat. Wrap the brisket in plastic wrap and refrigerate 2 to 24 hours. But if you choose you can certainly cook the brisket right away after applying the rub. Unwrap the brisket and place it in the slow cooker insert. Heat the oil in a large skillet over medium-high heat until hot. Add onions and garlic and cook until the onions are softened and lightly brown, about 6-8 minutes. Stir in all purpose flour and cook 1 minute. Whisk in slowly the chicken broth, scraping up any brown bits. Transfer to the slow cooker insert. Add the potatoes, carrots, thyme, bay leaves and stir in apple cidar vinegar into the slow cooker insert. Cover and cook on low 9 to 11 hours or on high 5 to 6 hours. Remove the brisket from the slow cooker to a cutting board and cover with aluminium foil 15-20 minutes. Carefully lift the vegetables from the slow cooker using a large slotted spoon, place in a bowl or platter and cover with aluminium foil. Let the liquid rest in the slow cooker 5-10 minutes, and then skim any fat from the surface using a large spoon. Remove the bay leaves. Thinly slice the brisket across the grain, don't slice with the grain, slicing with the grain will toughen the meat. Season the sauce in the slow cooker with salt and pepper, spoon some of the sauce over the meat, and serve remaining sauce in a gravy boat.